This is not a devotional classic. It is a dangerous tale: a call to ^the high stakes of every Christian's journey. Do not pick it up expecting quaint ^amusement--it is a story woven through with undeniable truth, great cost, and overwhelming ^joy. One of the most widely read books of all time, this adventure ^reveals John Bunyan's intense grasp of the Scriptures. Penned while in prison for ^refusing to compromise the gospel, The Pilgrim's Progress is a guide for ^the journey from death to life. The times have changed, but the landmarks and ^adversaries are very much the same. This is not a devotional classic; it is a dangerous tale. It is a ^call to the high stakes of every Christian's journey. Don't pick it up expecting ^quaint amusement- it is a story woven through with undeniable truth, great cost, ^and overwhelming joy. One of the most widely read books of all time, ^this adventure reveals John Bunyan's intense grasp of the Scriptures. Penned ^while in prison for refusing to compromise the gospel, The Pilgrim's Progress ^is a guide for the journey from death to life. The times have changed, but ^the landmarks and adversaries are very much the same. Of ^all the factors influencing our spiritual growth and development, pivotal books ^play a key role. Learning from those who have walked the path and fought the fight ^brings wisdom and strengthens resolve. And hearing the familiar chords of kingdom ^living sung by voices from other times can penetrate cultural barriers that limit ^our allegiance to the King. To this end, Moody Publishers is honored to introduce ^the first six volumes in what is to be an ongoing series of spiritual classics. ^Selected for their enduring influence and timeless perspective, these new editions ^promise to shape the lives of spiritual pilgrims for generations to come. A pilgrimage is an arduous journey, not a cross-continental flight. One of the most widely read books of all time, this adventure reveals John ^Bunyan's intense grasp of the Scriptures. Penned while in prison for refusing ^to compromise the gospel, The Pilgrim's Progress is a guide for the journey ^from death to life. The times have changed, but the landmarks and adversaries ^are very much the same. JOHN BUNYAN (1628-1688) was a Puritan preacher and writer in England. ^ Bunyan had very little schooling. He followed his father in the tinker's trade, ^and served in the parliamentary army from 1644 to 1647. In 1655, Bunyan became a ^deacon and began preaching. He experienced marked success from the start and was ^the pastor of the Bedford church. 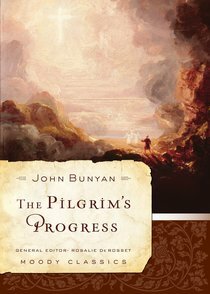 Bunyan is the author of The Pilgrim's Progress ^which he wrote in 1676 while imprisoned for preaching without a license. His numerous ^other titles include Grace Abounding to the Chief of Sinners and Holy ^War. DR. ROSALIE DE ROSSET is a professor of Literature, English ^and Homiletics at Moody Bible Institute where she has been for forty-two years. ^ She earned her M.A. in English from Northeastern Illinois University, M.Div. from ^Trinity Evangelical Divinity School, and Ph.D. in Language, Literacy, and Rhetoric ^from The University of Illinois at Chicago. In addition to teaching, she regularly ^appears on Moody Broadcasting Network programs as a guest and co-host, and speaks ^at conferences and seminars. She lives on the northside of Chicago. About "The Pilgrim's Progress (Moody Classic Series)"
This is not a devotional classic; it is a dangerous tale. It is a call to the high stakes of every Christian's journey. Don't pick it up expecting quaint amusement- it is a story woven through with undeniable truth, great cost, and overwhelming joy. ^- John Bunyan's personal memoir^- His last sermon^- Special sayings of Bunyan, about death and judgment, the joys of heaven, and much more^- Bunyan's personal account of his life before he accepted Christ^- The writer's account of his time spent in prison^- "The Barren Fig Tree"^- "The Holy War Made by Shaddai Upon Diabolus for the Regaining of the Metropolis of the World"
Customer Reviews For "The Pilgrim's Progress (Moody Classic Series)"
With there being so many editions to John Bunyan's "The Pilgrim's Progress," it's easy to be confounded with which one to select. I'd highly recommend this edition above the others, with the "Moody Classics" being a stamp of approval to assure the readers that an excellent choice was made. This version isn't one that has been abridged for an easy read, meaning it contains the richness of Bunyan's words and the beauty of the literacy which was known during the 17th century. This writing helps take the reader on an insightful journey and opens their mind to the excellency that was Bunyan's legacy of literacy. A very clever yet biblical portrayal of the Christian life. A classic in Christian literature, John Bunyan depicts the narrow road of a Christian as a pilgrimage towards the kingdom of God. It really challenges you to think about the path you're currently walking on and if you are truly walking with Christ.